Is it possible to have a luxury wedding on a budget? Not everyone can afford to throw money at a lavish wedding. But it is a special day and we want to look back on it with great memories. Here are ways you can have that luxury wedding on a budget without compromising your special day. Get them designed professionally but then ask for the template and print them yourself. Use the font the designer has chosen on all your wedding stationery, including the menus, the envelopes, the place settings etc. Go for a mid-range white card and add little extras such as crystals or glitter to give a bit more sparkle. The venue is probably one of the most expensive items on a couple’s list. If you want to impress your guests with a luxury wedding on a budget, choose a venue that is already extravagant in its own right. For example, an art gallery or museum in an historic building. Or why research stately homes in your area and see if they have areas in their grounds to rent for weddings for a little bit less? You quite often get spaces such as orangeries or keeper’s cottages that are suitable for a lovely backdrop to a wedding. Remember, the more historic or exotic the venue is, the less you have to spend on doing it up. Talking of doing up a venue, everyone likes to see a lot of flowers when they walk in. Either down the aisle or at the main altar. You can add a touch of luxury by using greenery to bulk up your floral choices here. It looks classy and sophisticated and won’t cost you a bundle either. And when you are thinking about your florals, remember there are always cheaper options that look almost the same. You can create an air of opulence if you use the right colours. For instance, purple is associated with royalty and wealth, and gold and silver are linked to money. If you don’t like purple then stick to rich, deep colours such as chocolate brown, velvety reds or lush greens. Stay away from pastels and neon colours. Pick two colours that complement each other such as chocolate and teal. Add a metallic touch to lift it all and use your colour theme throughout including your invitations and menus. Wedding catering is where a lot of the money is spent as no one wants their guests to go hungry on the big day. There are ways to make sure your guests are full and not spend a fortune. Instead of a starter offer your guests an amuse-bouche in the form of a tiny morsel that is designed to liven up their taste buds. These are usually free. Then go for cuisine that is typically affordable such as Indian, Mexican or Italian. Avoid a sit-down menu and instead opt for smartly dressed waiters with exciting platters of interesting food. This not only saves on food costs but you don’t need as many serving staff either. Plus it looks more impressive. If you are hiring furniture there are lots of ways you can get a luxury look for less. 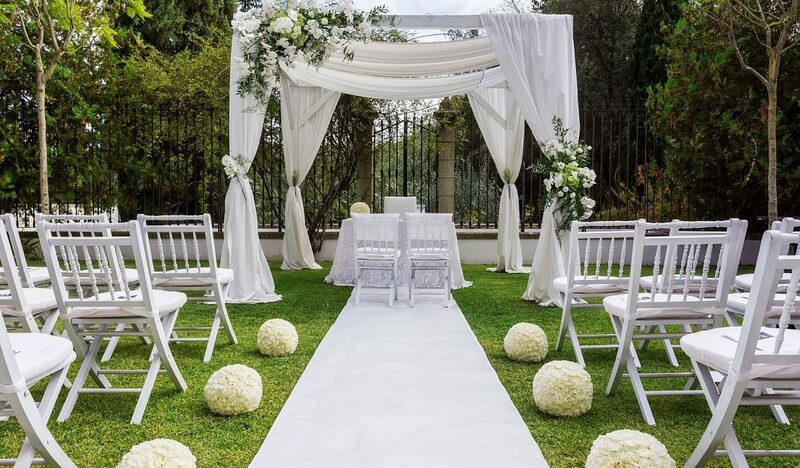 One way is to use luxurious chairs such as the Chiavari or the Cheltenham chairs for your guests of honour and then use a more standard one for the main party (see our main picture). You can dress up standard trestle tables with beautiful linen that matches your invitations. And look out for offers from your furniture hire company. For example, at Yahire, if you order the Chiavari or Crossback chairs we will supply charger plates for just £1 each. If you really have to have a three-tiered wedding cake at least fake the top two halves. Get a professional to make the bottom and largest half that you cut into for the photographs. The other tiers can be made using Styrofoam and icing. When it comes to giving out slices of cake for the guests, get the catering staff to use a tray bake cake with the same icing and flavours of the real one. No one will notice. The bridegroom hires his outfit so why doesn’t the bride hire hers? What is the point of spending thousands on a dress to be worn once and then put away? Why not hire one for the special day, take as many photographs as you like and then send it back for someone else to enjoy? Why hang onto it? We recycle and reuse everything else in our lives? Our final idea for a luxury wedding on a budget is to say no to an open bar and instead introduce a signature wedding cocktail for your guests. You can greet them with some cheap bubbly at the reception, or supply beer or wine. But these days no one expects a free bar.